AAV1 51507-AAV1 Please see plasmid 105553 for an alternative. AAV Retrograde 51507-AAVrg Please see plasmid 105553 or 105540 for an alternative. A fragment containing the pmSyn promoter-EBFP-Cre-bGHpA was swapped in to replace the CMV promoter-MCS-hGHpA sequence. Total insert size including the two ITRs is 4293 bp. This plasmid results in strong Cre expression levels, but little to no detectable EBFP. Please see plasmid 105553 for an alternative. Ready-to-use AAV1 particles produced from AAV pmSyn1-EBFP-Cre (#51507). In addition to the viral particles, you will also receive purified AAV pmSyn1-EBFP-Cre plasmid DNA. EBFP-Cre expression under a human synapsin1 promoter. These AAV preparations are suitable purity for injection into animals. This viral item has been discontinued. Please see pENN.AAV.hSyn.Cre.WPRE.hGH (Addgene 105553-AAV9) for an alternative. 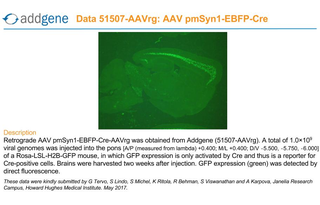 Ready-to-use AAV5 particles produced from AAV pmSyn1-EBFP-Cre (#51507). In addition to the viral particles, you will also receive purified AAV pmSyn1-EBFP-Cre plasmid DNA. Please see plasmid 105553 or 105540 for an alternative. 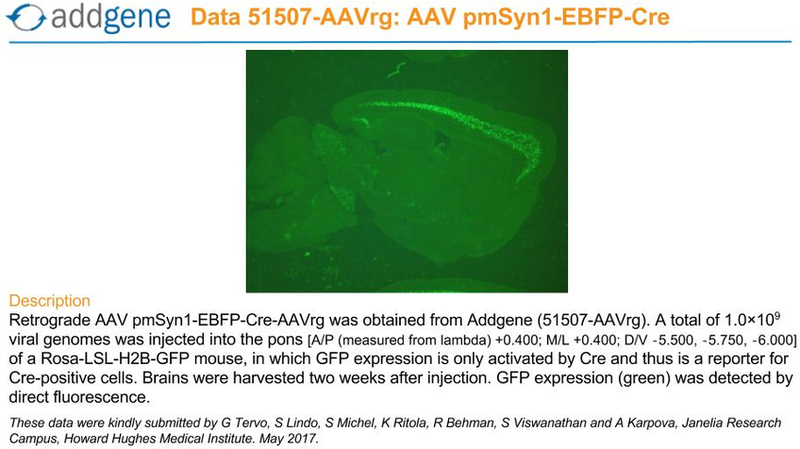 Ready-to-use AAV Retrograde particles produced from AAV pmSyn1-EBFP-Cre (#51507). In addition to the viral particles, you will also receive purified AAV pmSyn1-EBFP-Cre plasmid DNA. EBFP-Cre expression under a human synapsin1 promoter. These AAV were produced with a retrograde serotype, which permits retrograde access to projection neurons. These AAV preparations are suitable purity for injection into animals. Retrograde functionality is dependent on high viral titers. Addgene recommends not diluting your AAV preps prior to use. This viral item has been discontinued. 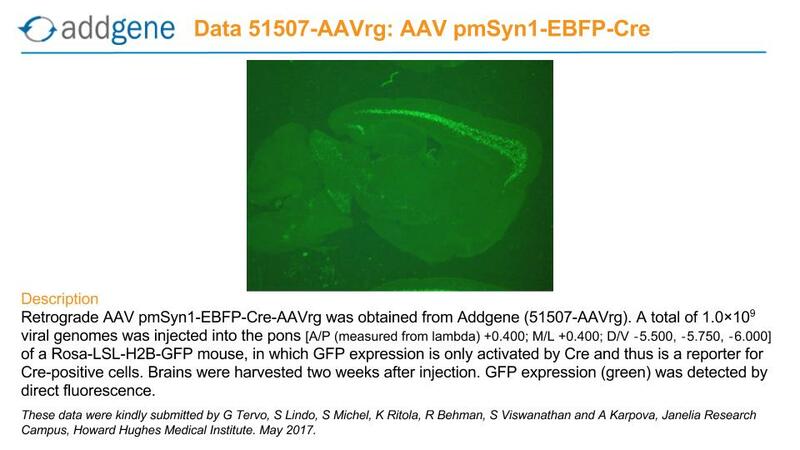 Please see pENN.AAV.hSyn.HI.eGFP-Cre.WPRE.SV40 (Addgene 105540-AAVrg) or pENN.AAV.hSyn.Cre.WPRE.hGH (Addgene 105553-AAVrg) for an alternative.